Although Virgo is not the most passionate of the zodiac signs, Venus in Virgo shows their affection through complete devotion and attention to detail. They work hard to make sure their partner is happy and healthy, sometimes to the point of nagging. But everything they do is to help people. Venus symbolizes love, money, sensuality, relationships, pleasure, and leisure. As a perfectionist, Venus in Virgo takes their relationships quite seriously and does whatever is necessary to please their soul mate. They listen intently and pick up on little cues, which is why they are so good with thoughtful gifts and caring gestures. They always know the perfect thing to cheer someone up and will go to great lengths to ensure it is delivered in an impeccable manner. If you show your appreciation for their help instead, you will see a softer side of Venus in Virgo. They simply want recognition for their hard work and dedication to their relationships. They don’t need much to make them happy. A safe home, close social circle, and someone to love who will love them back equally. While they aren’t as exciting as other star signs, they are solid and dependable and always have your back. You will not find a more loyal partner than the Virgo Venus person, for their top priority is their friends, family, and companion. While this is usually seen as charming and considerate, it can sometimes backfire if they go overboard. While they don’t go for a grand display of affection, they do get upset if their detailed plan doesn’t go their way. And if it’s not appreciated as much as they think it should be, they need plenty of time to themselves to get over the disappointment. 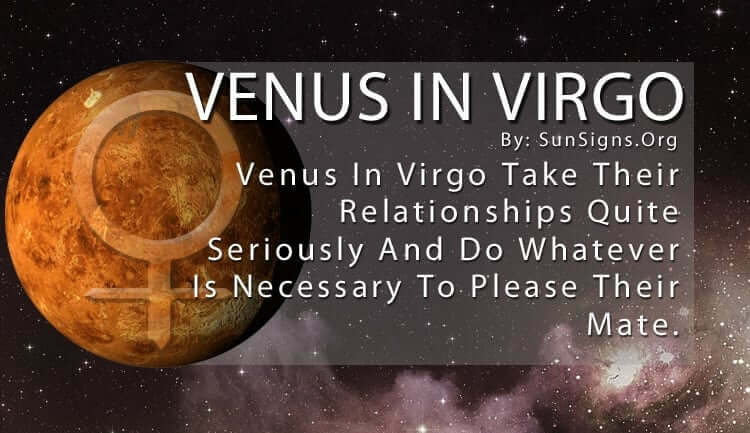 Venus in Virgo has the highest expectations not only with their actions but the actions of others around them. This means they place very strict standards on how they feel their loved ones should perform in their everyday lives. While some are able to match these standards, others fall short of the mark. And if Venus in Virgo feels their partner is one of those people, they will find it difficult not to criticize them. But the reasons for this are not vindictive. They simply want to get the best from those they care about. As long as the Virgo Venus people are given the recognition they feel they deserve (and they really do a lot for others that can go unnoticed) they are happy to continue that devotion. The only thing they have to worry about is taking some time for themselves. That’s the best way for their social network to reward them. Offer them the opportunity they need to relax.